Need more information about booking Home 7280352 ? Avon Accommodation is housed in a delightful thatched cottage which dates back many centuries. 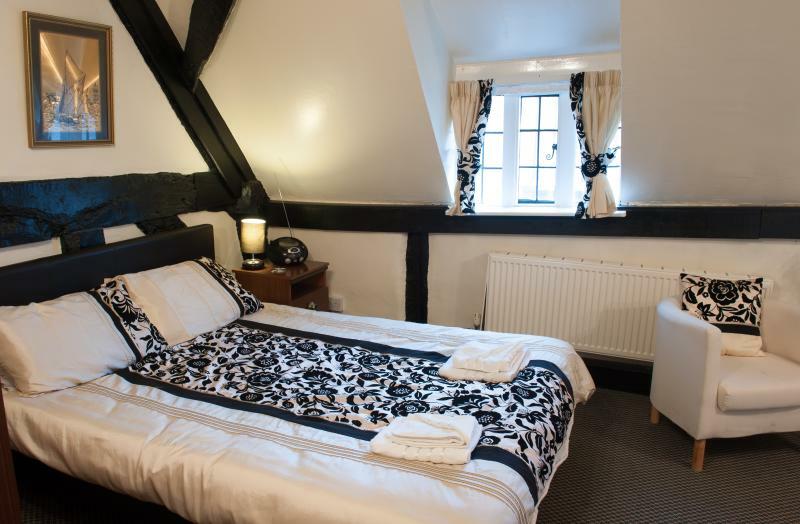 The suites are full of charm and character, sympathetically restored and refurbished offering high quality accommodation. Due to the age and nature of the property there are uneven floors, narrow steep stairs, some very low beams and door heights, so please mind your head! The accommodation comprises of two first floor apartment suites, Avon View and Avon Mist. Both were recently refurbished to reflect the character of the building. Due to the age of the structure the steep stairs may make the suites unsuitable for very young children or those who would find stairs difficult as we have no lift. Well behaved pets only by prior arrangement. Strictly no smoking. Separate bathroom with bath/shower, basin, w.c. Lounge area with large fitted wardrobes, flatscreen digital TV DVD player with Freeview, DVD Library, radio /CD player, folding dining table with 6 chairs and electric coal effect fire and 2 fold up beds if required. Equipped mini kitchen with microwave, electric hob, toaster, fridge with ice box, sink, folding prep table. Large bedroom with double bed, flatscreen digital TV DVD player with Freeview, triple wardrobe, bedside cabinets, bedside lamps, small table with two tub chairs, full length mirror, iron & ironing board, hairdryer, and tea/coffee making facility. Through to small bedroom with bunk beds, chest of drawers, bedside lamp. Welcome Pack with milk, breakfast cereal and wine. Linen and towels provided at no additional charge. Central heating and electricity inclusive. Our guests are offered a 10% discount from the full bill on meals eaten in the restaurant below at lunch or dinner (not available bank holidays or commemorative days,such as Mother's Day). The garden alongside the river is available for guests to enjoy. There is limited off road parking and free parking on the adjacent streets (daytime time restrictions apply) as well as public car parks within a short walk. The market place and town centre with its many shops, pubs and restaurants are a few minutes walk. A comprehensive range of shops both independently owned and national chains such as Phase Eight, Jaeger, Fat Face, Clarkes, W.H. Smith etc. A wealth of cafeterias and restaurants including Italian and Indian; mainly independents but with a couple of nationals such as Nero Coffee and Prezzo’s. Coarse fishing right outside the door; day tickets can be purchased from the tackle shops opposite. Riding schools nearby offering hacks across the New Forest for both the beginner and the more experienced rider. Twelve miles from Bournemouth and its award winning beaches. Fifteen miles from Salisbury where you will find Stonehenge and the tallest Cathedral Spire in England. Half a dozen golf courses within a 10/15 minute drive. You can get in touch with Tricia (the owner) through the contact form on this page. Send Tricia (the owner) an email through the contact form on this page. Alternatively, if there’s a phone number on this page, you can call them. How do I contact Tricia (the owner)? If you’ve already booked, go to Manage your holiday booking to view Tricia the owner's contact details or send them a message. Or send Tricia (the owner) an enquiry through the Contact the owner/manager form if you’d like a quote or more info first. When you pay online through the Book your stay form, a booking request is sent to Tricia (the owner). You’ll find out within 24 hours whether they’ve accepted - no money will leave your account before then. You can also request a quote from Tricia (the owner) through the contact form. The owner will email you the total cost for your dates and a link to book and pay online. Use the Book your stay form to pay provisionally online. You can pay by credit/debit card or PayPal. Tricia (the owner) will have 24 hours to accept the booking and no money will leave your account before then. Why can't I call Tricia (the owner) before booking? You’ll need to contact Tricia (the owner) to do this. Send them a message in Manage your holiday booking or through the contact form on this page. You can request to change the dates or number of people on your booking via the Manage your holiday booking page. To change your holiday dates use the Edit booking button. If you need to change the number of guests staying then send Tricia (the owner) a message. If Tricia (the owner) agrees, they’ll send you a revised quote outlining the changes. You can review and accept/decline this from the Manage your holiday booking page. You’ll have 48 hours to take action before the revised quote expires.